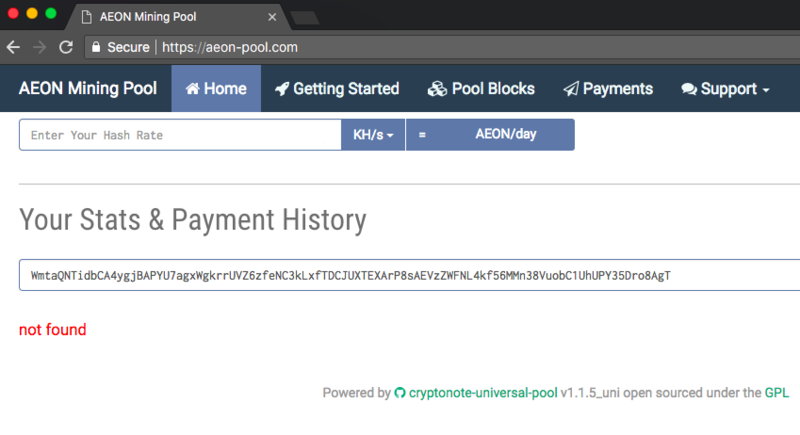 I logged in after some few weeks of setting up my XMR-stack miner( and an aeonpocket wallet address) with aeon-pool.com. After login in I was unable to find my coins that was transferred to me by the pool. jayish I can't find your wallet address in https://aeon-pool.com/, so where did you get the transaction hash from? jayish Okay, I can confirm that I can't find that transaction. Thanks so much for the help. However, after a thorough review, I discovered I was checking the pool with the wrong details. The view key I was using was wrong. I got the right one and all my coins are there plus the extra you sent. Do let me know where to transfer your 0.5 AEON. I am really sorry for all the trouble.